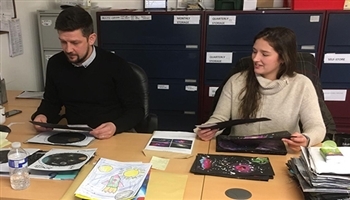 As part of the ongoing celebrations of the Black Arrow's return to the UK, Bishop’s Move Edinburgh and Skyrora Ltd invited local primary schools in the Penicuik area to enter a fun drawing competition. The theme was simply SPACE.... and the children's entries were truly out of this world! Bishop's Move Edinburgh was inundated with entries from children at Bilston Primary School, Cornbank Primary School, Mauricewood Primary School and Strathesk Primary School. Entries included an intergalactic range of imaginative drawings created from chalk, watercolour, felt-tip pens, colouring pencils and much more, leaving our Edinburgh branch manager, Kenny Janczyk, and Skyrora Ltd's Business Development Executive, Becky Morris, with a hard task of selecting the winners! And here are the stellar winning SPACE drawings!! All of the above winners have been invited, with their respective teachers, to the unveiling of the rocket at Bishop's Move Edinburgh where they will have a chance to see Britain's most successful space rocket, the Black Arrow.